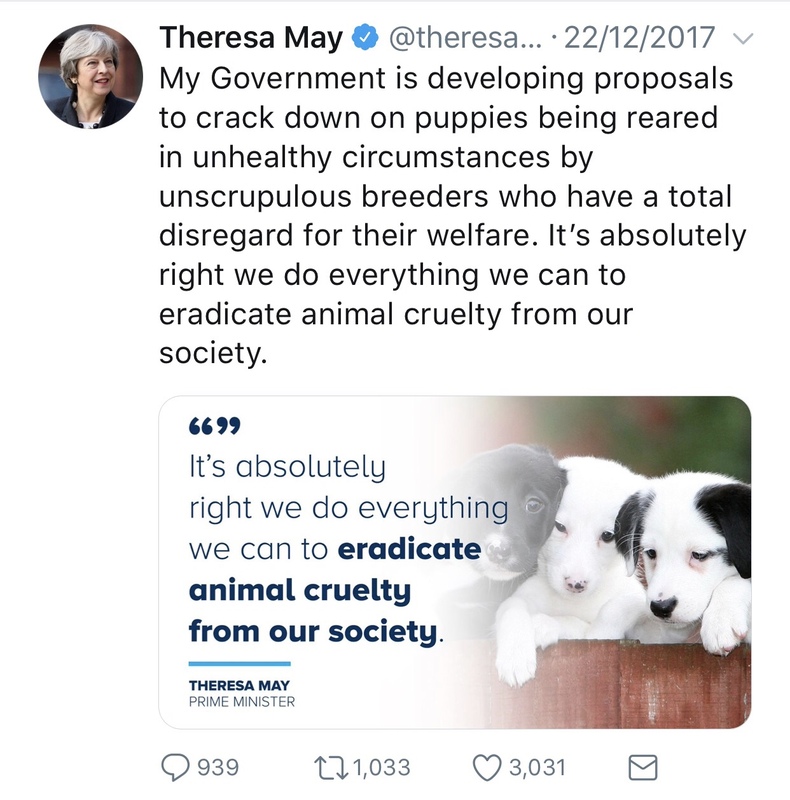 Now the UK Prime Minister has announced new restrictions on how dogs are bred and the pups are sold in a bid to crackdown on unethical breeding methods and puppy farming. Theresa May’s new tighter controls – which are due to come into force this year – will mean puppies will only be sold in the presence of the new owner, and the mother of the puppy must also be there. This is to try and ensure puppies are only sold by licensed breeders and not by those who trade in puppy smuggling, and to stop online sales where the prospective new owners have not seen the animal first. While the new rules will enhance the safety and health of our loveable furry companions – something every animal lover should support – it will change how islanders buy and collect their puppies from the UK. Currently most new dog owners make the journey over to collect the puppy, but not all go to the breeders address once they are there. The RSPCA have warned islanders: “While it may be easier for people living in the Channel Islands to buy a puppy over the internet from a breeder in England and arrange collection by meeting at an airport it is extremely risky as there is no guarantee that dog has been properly cared for and will be happy and healthy. But it’s not just those looking for a cute little puppy who are duped by unscrupulous dog sellers according to Carla: “We have also noticed a people fall for the rescue pup story which pulls on the heart strings and can provide convenient excuses as to why the mother isn’t around. People need to be vigilant. We have been told by many proud people that they have ‘rescued’ their puppy from a puppy farm, but the truth is that those who have paid for a pup bred by an unscrupulous breeder have contributed to the problem regardless of their intentions. Both the JSPCA and the GSPCA have welcomed the new regulations, which also orders every advert to include details of the sellers licence number and where they live. New rules on how puppies are sold in the UK could mean islanders will have to make longer, more expensive trips to collect their new furry friend. Choosing to bring a dog into your life is not only a big decision but it can be a daunting one – especially as there is a heightened risk of islanders unknowingly falling victim to the dark underworld of puppy farming – due to having to shop online because of the limited number of breeders on-island. The problem also being encountered by our neighbours. The GSPCA Manager, Steve Bryne said every year they are made aware of puppies that have been: “sourced in ways that could mean that they have come from puppy farms or sources where the animals welfare is extremely concerning.” The issues of which were seen first hand when the GSPCA took in 25 Slovakian puppies that were stopped at Guernsey harbour in 2015 as they were being smuggled in filthy conditions.